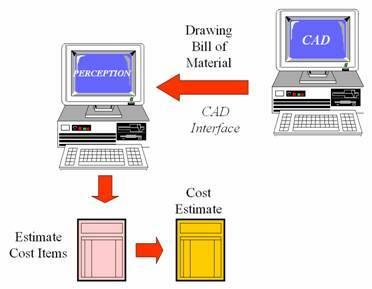 PERCEPTION can link with a variety of computer-aided design (CAD) systems to expedite the development of detailed bills of material for either cost estimating and/or for the requisitioning, purchasing, and production material control processes. Several interfaces are available between PERCEPTION and other software products. Some of these interfaces are achieved generically, using PERCEPTION’s standard mapping and importing functions. CAD products for which the generic interfaces apply include ShipConstructor, AutoCAD, AutoPLANT, and MicroStation. These products have internal functions to export bills of material data files that are easy to map and import into PERCEPTION. Other programmed interfaces also have been established for other software products that have no functions for exporting data files. Several of these interfaces are achieved using advanced linking technologies that enable PERCEPTION processes to be initiated directly from within the CAD system. A library of COM objects is available to expose the PERCEPTION database to 3rd party software products. These components support ODBC, OLE DB, and native mode database activity. 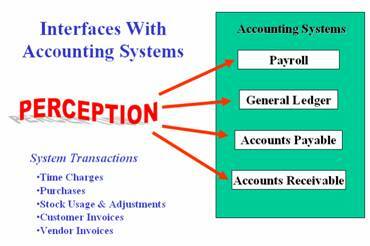 Similar methods have been applied to link PERCEPTION to 3rd party accounting system that provide payroll, general ledger, accounts payable and receivable functions. Links are available for Great Plains, Peachtree and Quick Books. 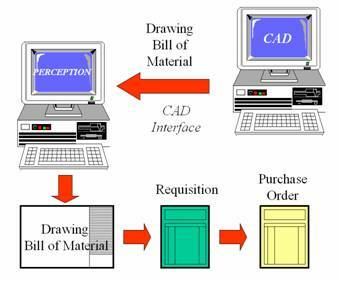 Since most accounting systems offer import and export functions, linking PERCEPTION to them using PERCEPTION’s data mapping functions is not difficult. PERCEPTION is a Registered Trademark of SPAR Associates, Inc. ESTI-MATE, WORK-PAC, PERT-PAC, and MAT-PAC are Trademarks of SPAR.